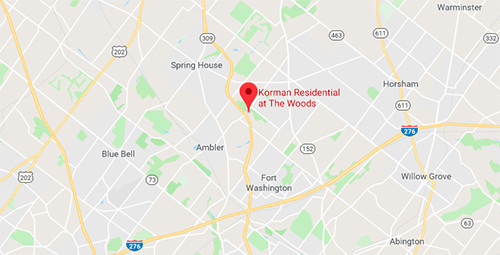 Korman Residential at The Woods now has newly renovated Ambler, PA apartments for rent featuring pet-friendly one-bedroom and two-bedroom home options in the most convenient location. Relax in the clubhouse with Wi-Fi, billiards, and business center with complimentary internet and printing. Enjoy additional community amenities like our private Woof Woof Club off-leash dog park, the Common Ground Community Garden, swimming pool and sundeck with free poolside Wi-Fi, 24/7 fitness center, lit tennis courts and basketball courts, and barbecue area with grilling. The spacious floor plans at Korman Residential at The Woods come with fully equipped kitchens, lots of closet space, and many new upgrades (in select homes), including stainless steel appliances, new countertops and flooring, enhanced lighting features, and desirable fixtures. Korman Residential at The Woods also offers furnished apartments for rent and corporate suites. Located just off Route 309, and two minutes from the Pennsylvania Turnpike, right outside the Temple University Ambler Campus. These are some of the best apartments Montgomery County has to offer. Korman Residential at The Woods is highly ideal for business professionals and Temple University students alike. Ask us about our 100% Move-In Satisfaction Guarantee and contact a leasing agent to schedule your personal tour of our apartment community in Ambler, PA.